date of 18-02-2019. Must have submit the online submitted application copy to BHU on or before 23-02-2019. Candidates selection will be based on written exam or interview for this Banaras Hindu University Teaching and Non Teaching Jobs. 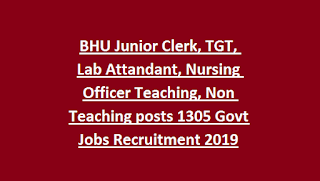 Official website for online form submission for this BHU Junior Clerk, TGT, Lab Attendant, Nursing Officer recruitment is http://www.bhu.ac.in/. Detailed information about Banaras Hindu University Teaching and Non Teaching Posts vacancies are updated below. 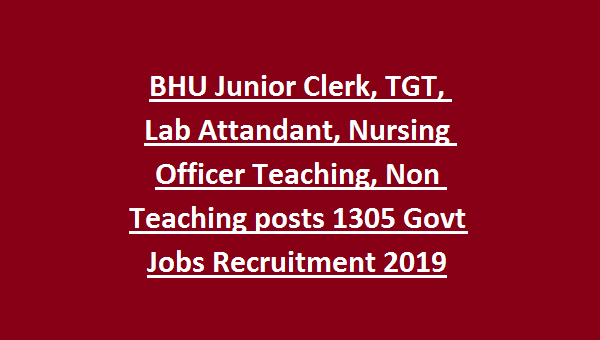 There are total 1305 posts are in this Banaras Hindu University Teaching and Non Teaching Posts recruitment 2019. Age limits given in official website as post wise. For Junior Clerk Posts: Second Class Graduate with at least six months of training on the use of Computer for Office Automation, Book keeping and word processing. For Nursing Officer Jobs: B.Sc Nursing or GNM diploma with 30 months of experience in 50 bedded hospital. No fee for SC/ST and PWDs. For all posts written exam or interview will be conducted for this BHU recruitment 2019. For Junior Clerk posts Computer Skill Test will be conducted. Refer notification for exam pattern and syllabus for this BHU Recruitment of Non Teaching Staff and School Teaching Staff vacancies. Apply online for this Teaching and Non Teaching Posts of BHU through official website of Banaras Hindu University at http://www.bhu.ac.in/. Last date to online form submission is 16-02-2019. Last date to reach the application form (online submitted copy) to the below given address is 23-02-2019.